You are here: Home / Opinions / Brand Relations and Blogging; Has That Glowing Article Been Enticed? 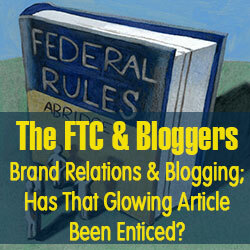 Share the post "Brand Relations and Blogging; Has That Glowing Article Been Enticed?" An eye-opener article. It was only a few months ago I realized that there exists a huge number of mommies who own a blog or two, and are very active on it. They mostly write about brands, products, experiences. Honestly, the fact that people pay for reviews (barter system or money system), took the ground under my feet. How can I know now which review on internet is not fake? How do I believe which advice to follow and which not! I agree, if the disclosure is made, the reader is made aware of the trade between the blogger and the company. But still how the reader benefits! I may sound negative but that is what it is. I am glad I know that FTC is trying to make out a clean web. Thanks! Question, though. When I blog about a movie or concert and am provided tickets by the studio or promoter, etc., why should I disclose that “Divergent” or “Veronica Mars” or “Bon Jovi” gave me the tickets? They did not. It just does not make any sense to me. I appreciate what you are saying and you are clearly very knowledgeable on the subject matter however I think being dishonest about who my relationship is with is also not the correct thing to do. I do not benefit by saying I have a relationship with Knotts Berry Farm when my relationship is with an agency. Also, often, a brand such as Knotts is doing their own in-house relations and so seeing a post wherein the blogger says “Knotts” may confuse their reporting. So they ask their agencies to act accordingly. Just more food for though. Thank you for your time. Thanks for the compliment. Your comment addresses a complete different issue, possible another good subject for a future article. Thanks for the heads up. My first hope from this article is that bloggers actually disclose and properly disclose according to the FTC, if that is a blog post or social media post. My second hope is to educate the general public of what is ethical in the blogging space. That the FTC put out clear guidelines that are easy to spot if a blogger wants to be ethical or unethical/being shady such as not disclosing or improperly disclosing for example putting disclosures at the bottom, or in smaller text or using the wrong wording…… Making the general public understand some of the FTC clear do’s and don’ts on this subject which they can use to their advantage to pick ethical blogs to read. That way they can read between the lines and be able to make an informed decisions, such as choosing blogs to follow/read/trust and purchasing items they have read about on various blogs.